Extra Yarn. I love it (and not just because there are dogs wearing sweaters in it). | Shelf Elf: read, write, rave. Extra Yarn. I love it (and not just because there are dogs wearing sweaters in it). 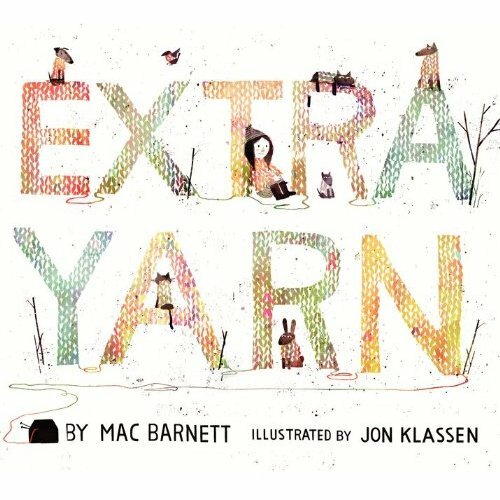 I am more than a little bit in love with Extra Yarn by Mac Barnett, with illustrations by the always stylish Jon Klassen. It is not because I currently have a lot of extra yarn in my house from my former days of knitting semi-glory (some of it is in Gryffindor colours for a scarf I have yet to finish for my hubs. Sorry D. One day, one day). It is not only because it is a story that has more than one small dog wearing a sweater in it (not to mention plenty of other animals wearing tiny sweaters). No my friends, it is due to the fact that this book is perfect. There, I said it. Perfect. I cannot imagine it being better. It’s a good sign that it was hard for me to stop hugging the book to review it, right? 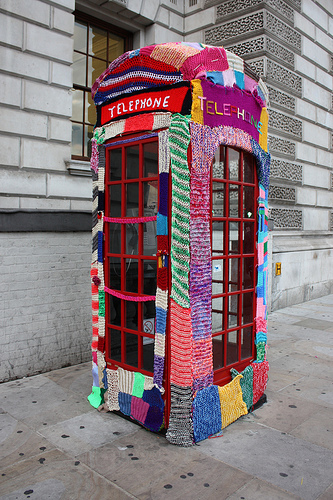 Annabelle does not knit a phone booth cosy (the brainchild of this amazing group), but she does become a guerilla knitter. Do you know about this movement? It’s when knitters take to the street and knit things for places / objects that you’d never think require sweaters or else create knitted objects that interact with buildings / statues / stuff in the city. The group responsible for the knitted phone cosy above, is called Knit the City, and one of the reasons they give for doing what they do is to “wage woolly war on the mundane, humdrum and expected.” They believe that the world can be made better by this whimsical act. Have you ever seen the result of a little guerilla knitting? I have. On our Sunday walk we pass a park bench that has arm rests which have knitted covers. One week they were normal bench arm rests, and the next they were knitted. It wasn’t the most creative act of guerilla knitting, but we were still charmed to find it. Back to Annabelle. Basically, she changes her whole town through her knitting. There’s a twist I won’t tell you about because I don’t want to reveal everything about the book before you have a chance to read it / hug it for yourself. Extra Yarn is about making your community better by doing something small and how that something small can sometimes become something bigger. You never really know where an idea will take you. It’s about creativity and being quirky and proud of it. It’s about magic and creating goodness. And dog sweaters. That too. Make something. Make beauty. Be different. Extra Yarn is published by Balzer + Bray, an imprint of Harper Collins. Thank you for sending me a copy to review! This entry was posted in Illustration, Picture Books on January 22, 2012 by shelfelf. I’ve been looking forward to this one. Mac Barnett has become one of my favorite writers. Dogs wearing sweaters is icing on the cake. Cats in sweaters deserve love too!